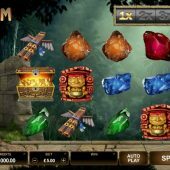 Jungle Jim El Dorado is a Microgaming adventure-themed slot and the sequel to the original Jungle Jim slot. Although when you first set eyes on this game you could be forgiven for thinking that its a copy of Netent’s blockbuster slot Gonzo’s Quest, such is their similarity. The crusader, battling through the jungle to find secret treasure must be a successful theme, as we have seen it many times before. Examples include Novo's Book of Ra Deluxe and Play'n Go's Richie Wilde and The Aztec Idols. Jungle Jim El Dorado is a 5 reel, 3 row slot and comes with 25 paylines. It introduces Microgaming's Rolling Reels™ which sees the symbols drop on the reels from above and any symbols used in a winning line will then explode to be substituted by new symbols (think Cascading or Exploding reels in other slots like IGT's Davinci Diamonds). By getting consecutive wins you can increase your winnings by up to 5x in the base game and up to15x in the free spins feature! Other important symbols include the Jungle Wild symbol, which counts as a Wild for all symbols except for the scatter symbol. The treasure chest symbol is the top paying symbol in this slot and will pay 120x stake when hitting 5-of-a-kind (5OAK). Please note the multipliers in brackets are what you would receive in the base game, as a comparison. The good news is the free spins feature can be retriggered, should you land 3 scatters on the first 3 reels in the feature. 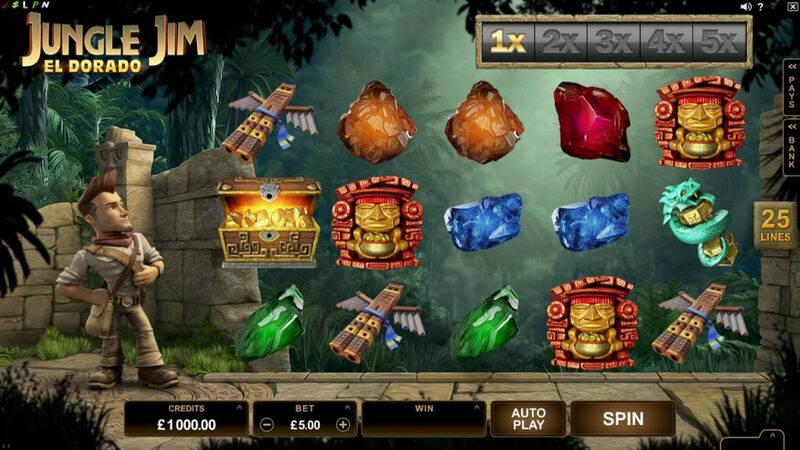 I think Jungle Jim El Dorado is a decent slot, but there are question marks around its originality. The Rolling Reels™ give a bit of a different dimension to the game play but it is not something we haven't seen before. This slot is medium volatility and an average RTP of 95.48%, so very middle of the road on that front. The games graphics and sounds are probably the most redeeming feature of this game and for Microgaming fans they will be pleased to get a Gonzo's Quest equivalent. However, I personally don't think I will be following Jim on this quest as there is nothing new here for me.